Part of our high purity manufacturing suite, AdvantaPure's Mold Shop utilizes a Class 7 (Class 10,000) ISO-certified clean room to produce a variety of molded components suitable for any number of applications in the pharmaceutical, chemical, food and dairy, beverage, cosmetic, biomedical, and biotechnology industries. Our molded products can be custom made to meet your application's specific requirements. Contact your AdvantaPure representative for more details. By combining AdvantaSil® platinum-cured, Class VI silicone tubing or AdvantaFlex® Biopharmaceutical grade TPE with molded fittings, stoppers and other components, a wide variety of assembly options are possible. Designs range from simple, single fitting connections to manifolds of complex configurations with varying lengths of tubing and several molded connections. 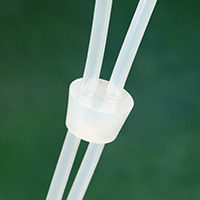 The process used to join tubing and molded fittings permanently bonds the parts into one unit. 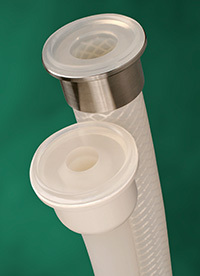 Leaks and entrapment concerns, common with the use of barbed fittings, are eliminated. BioClosure container closures are made from Class VI, platinum-cured silicone elastomer for the utmost in purity and consist of silicone bottle stoppers and sealing systems for bottles, laboratory equipment, and process and storage containers. They are biologically safe and work with receptacles of glass, metal, or plastic. 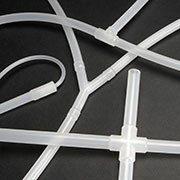 Available with cored holes for tubing, dip tubes, or vents and with tubing installed. Standardized configurations for media bottles, flasks and carboys using AdvantaFlex Biopharmaceutical Grade TPE tubing and molded components are available. Supplied as silicone fittings attached directly to silicone tubing or hose, the assemblies are well-suited for applications involving aseptic transfer, sterile processing, and other critical applications. The construction of Molded Silicone Assemblies allows the benefits of Class VI, platinum-cured silicone to remain constant throughout the assembly.